Smock, Checked cotton, PVMA. #2000.01.869. Edited to correct numerous typos and to add a bad sketch of the OSV apron. Don’t try to do research while conducting a small but energetic boy through a musket exhibit. Two aprons, many questions, all of them excellent. It’s really tough when an extant garment lacks provenance or even faux-venance, as in the “Revolutionary War” garments that turn out to be later. So, where do we look to figure things out when we a) like a garment a lot and don’t know if it’s right or b) are embarking on something a little new? And yes, in this case, we are talking bibbed aprons in the first quarter of the nineteenth century, in Rhode Island and in the Missouri Territory. 1. What documentary sources can I find? 2. Is the form plausible for time period/area? 3. What is the typical fabric for the time period/area? 4. Is the item appropriate for my character/persona/impression? What documentary sources do we have? OSV’s apron: I do my best work on the fly. We have some extant garments, two with images. 4. Apron 2005.24.4 at Historic New England has an intriguing description: A reddish brown linen apron with blue and white plaid. 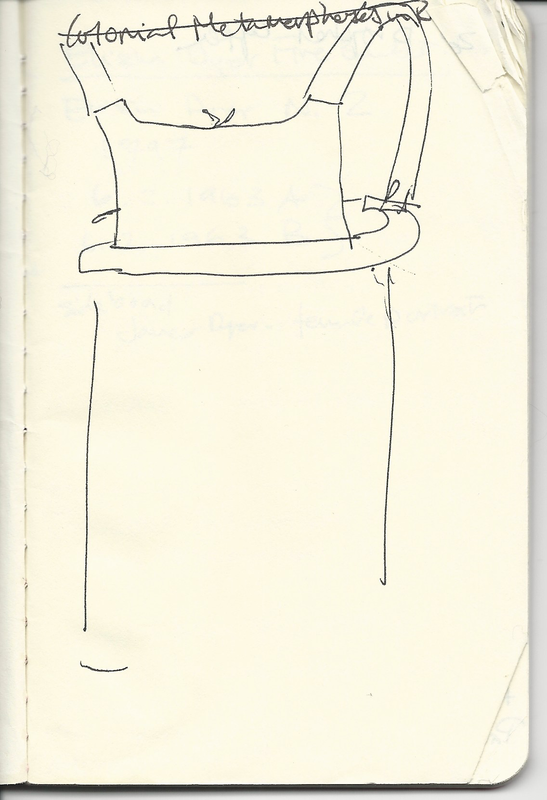 The apron is smock-like, with two holes for the arms and ties that extend from under the arms to the back. The bottom has a double hem. The neckline can be tightened or loosened with a blue and white string. What does that look like? Could it look like the Stonington plaid? It’s certainly a plausible New England weave 1810-1820. We have some imagery from the United States. What else is out there? MHS’s database has an Apache error today, so not sure what aprons they have, though they’re exactly where we need to look for one instance. I’ve looked and failed to find aprons of this description in the following catalogs: Historic New Orleans, Chicago Historical Society, State Historical Society of Wisconsin, Connecticut Historical Society, the Met, MFA Boston, Maine Historical Society, New Hampshire Historical Society, Ohio Historical Society, Newport Historical Society and Little Compton (RI) Historical Society. I’m now really tired of interacting with Past Perfect software. We have 5 objects and one image, all found in a cursory afternoon. Me, I’m still liking this form for the first quarter of the nineteenth century in the United States. I think the form varies somewhat, as can be seen in the descriptions; the OSV apron is the outlier, with the other 4 extant garments seeming more smock-like. 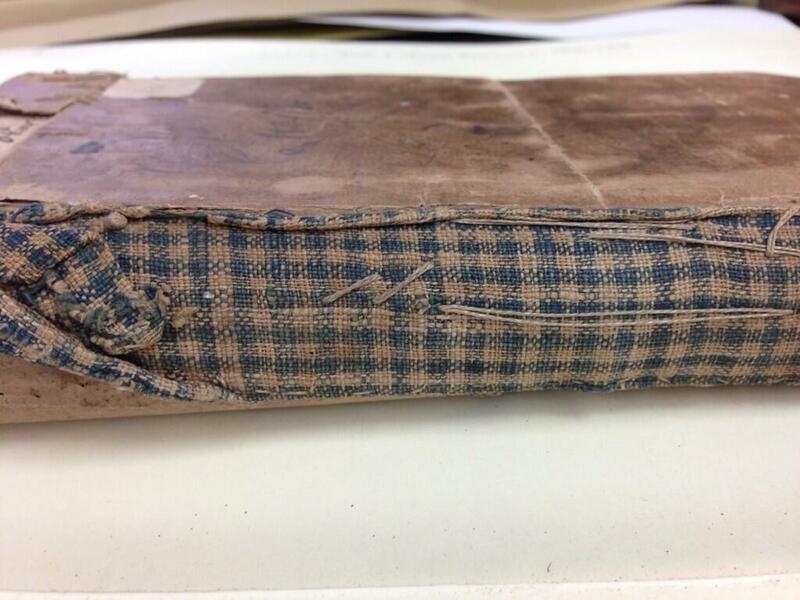 From RIHS MSS 72, Preserved Pearce papers, Tailor’s and Tavern account books, 1778-1781. Neither the OSV apron nor the PVMA smock have much (any) provenance, but the fabric is very typical of New England from the Connecticut River to the coast; it appears in inventories from 1777, on home- bound volumes, extant aprons in Deerfield and and in sample books from 1815. Blue and white check: I am comfortable saying that those two aprons are 1800-1820 New England based on form and fabric. I am delighted to have found it in the apron at Colonial Williamsburg, which is thought to be from the Southeastern United States. I think that expand the range down the eastern seaboard. With the evidence of the extant garments and fabrics typical in New England, I am still OK with this form of apron, even if my rendition of the OSV apron is rather poor, thank you for noticing. But what about Missouri? What should you wear out there, on the banks of the Mississippi? Enter Anna Maria Von Phul. She is a little sketchy on some details– these are watercolors, after all–but I think she would have made the apron blue if it was made of blue and white check. She has rendered some stripes (?) in the head scarf, so she does hint at some detail. Because I know AMVP, I believe that she is documenting fashions pretty typical of the time and place. The ladies she portrays in St. Louis in 1818 are fashionably dressed and not behind the times for the year, even if we cannot see every detail of dress. If I were to make the cognitive leap that women across what is now the eastern half-or-so of the United States wore bibbed-style smocks or aprons between 1810-1820, and made them up in the most common fabric of their area (cue blue and white checks for New England), I might step back from that link in Wm Booth’s catalog. If I were to copy this image’s apron, I think I would make it in plain, unbleached linen, based on how I read this color and shading. Ideally, you would find bracketing aprons– that is, some a little earlier and some a little later– in a “typical” fabric. I didn’t find those animals in the Western Reserve or Louisiana Purchase Territory collections available online, but that only means I didn’t dig in hard enough. I don’t think these utilitarian garments will turn up in shop records, and I don’t think we are likely to find detailed probate inventory descriptions– mostly it says “apron,” which is too general for our purposes. We won’t find runaway ads: it’s too late for those, and a little early for newspapers in the Territories, though it wouldn’t hurt to search online. I think our best alternate documentary sources in this case will be in diaries (again, we may not get the specificity we want; Sylvia Lewis only makes Spencers differentiated by color, so we are ignorant of collar shape, trims, number of buttons, closures, etc.) and in watercolors and drawings, often amateur, of everyday life. After all, you can never have too many sources. Well…the evidence on the PVMA smock is of some use, though stains can be acquired in storage, too. The CW smock-apron is less used. 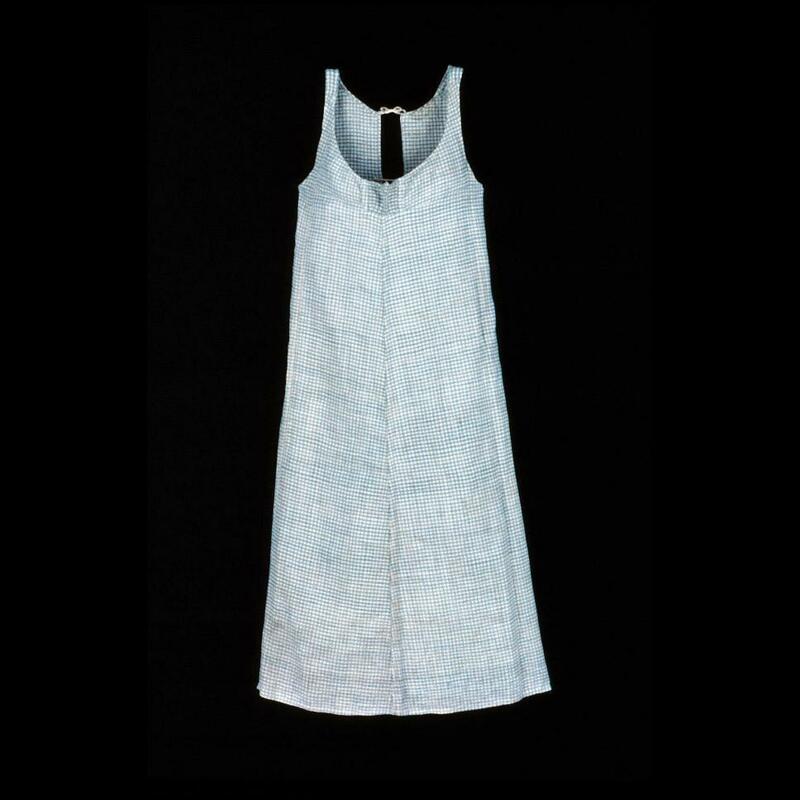 I think this form in a checked or plain linen fabric would be best suited for everyday and working wear, cleaning, cooking, gardening, but not for serving at table (in a house that supported that), and not for dress or best, when white would have been what was wanted. As far as I know, that’s not an internet meme yet, but it might as well be. It’s meme in my head, and that’s what counts. While I should be thinking about the probability of Spencer-wearing in 1800 Rhode Island, I got distracted during a hunt for head wraps and found this lovely little water color. How lovely is that coat? The Young Mr already has a semblance of that hat and trouser (admittedly too short) so the coat and a matelasse waistcoat would be just the ticket to recreate this image. He’ll bring his own sulky look to the party. I’m trying to figure out what the coat would be made of, and what I’m willing to pay for a coat that will be grown out of rapidly. In the meantime, though, what a lovely image. Back to coat dreams…and plots. 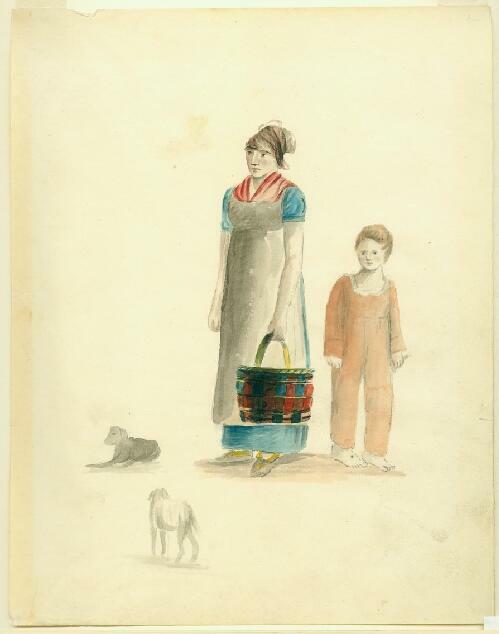 Anna Maria von Phul’s delicate watercolors of Saint Louis in 1818 (example at left) remind us that cities in the hinterland of America have never been as far behind the times as coastal dwellers might imagine. As a former resident of the Great Fly Over, I know how defensive people can be about their relative sophistication, and that could be why our Young Lady here appears slightly defensive in her posture. The young lady is certainly fashionable in that white gown, and literate, too, though we cannot see what she is reading; perhaps Maria Edgeworth. It took some doing to find a similarly posed and dated fashion plate with a book, for fashion has always been more fantasy than reality.